The Nuthatch is one of my favourite birds and is surprisingly not all that hard to photograph. I hope this guide helps you to capture some wonderful images. Nuthatches are quite exotic looking birds, resembling a small woodpecker with a paint job. Their blue, grey and buff colouring make them an attractive species to photograph and almost impossible to confuse with any other bird. A rule of thumb is that if you see a small bird working its way down a tree trunk probing for food it is probably a Nuthatch, Treecreepers on the other hand almost always work up the tree. 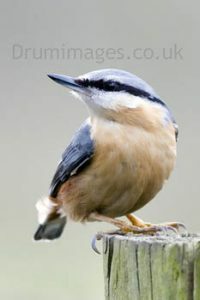 The Nuthatch occurs across most of Western Europe, although not Ireland or most of Scotland, and there are a couple of variations on the species in Europe – for example the Corsican Nuthatch. Although I will be discussing the Eurasian Nuthatch, there are 25 or so species around the world and this guide could apply to any of them. Most species are monogamous and pair for life …ahhhh bless!! They’re usually quite sedentary birds in that they don’t move far on long flights and are almost always associated with mature woodland. It is unlikely that one will turn up on your garden feeder if you aren’t lucky enough to live near deciduous woodland. They will, however, use manmade nestboxes and do become regular garden visitors if you have the right territory nearby. It is unlikely that they will fly across large open areas to reach your peanuts no matter how attractive they may seem. If they do arrive at your bird table they tend to do so in a blaze of glory, scaring off other species and scattering peanuts and seeds across the garden. It sounds obvious, but firstly you have to find the bird. Their colouring may seem exotic but it is very effective camouflage and they can be hard to spot. They add to the challenge by spending a lot of time high up in the treetops or hidden behind large branches. The good news is that although they are rare garden visitors, they do visit feeders in parks and at nature reserves regularly and are also creatures of habit; they will return to the same feeder again and again. Nuthatches are also fairly easy to bait; some of my best images have been taken at a site where I regularly left food out to attract the birds and found that they would arrive on site within seconds of the bait being placed. They are also quite an inquisitive species, so don’t disturb easily – I’ve had one bird land on a branch within inches of my left ear and not appear at all phased by my presence. My best tip if you do put food out is this: don’t put out whole nuts. The Nuthatch will arrive, take a bill-full of nuts and shoot off before you have time to press a button. If you crush the nuts into small pieces the bird will have to stop and take more time to collect the food, allowing you the chance to record the images you want. Please remember that you should not over bait any one site, doing so might encourage the birds to become dependent on your food supply. You won’t necessarily need a long lens to photograph Nuthatches, depending on where you see them. Sadly most parks and nature reserves aren’t designed with photographers in mind and hides are often a long way from the feeders. But, if you find a good baiting site, you may be able to sit comfortably in your car and have the birds flying to a perch almost within touching distance. Nuthatches are best photographed in early morning or late evening light; the warmth of the light at those times really enhances the beautiful tones of their colouring. However, the most challenging aspect of photographing this bird is presented by their dark eye stripe. It is easy to ‘lose’ the bird’s eye in the stripe if you don’t get the exposure quite right and you end up with an image of an “eyeless” bird. So a catchlight in the bird’s eye is essential. The contrasting colours of the bird’s feathers don’t really present a problem, because although they are colourful, they are subtle and not as challenging as say a Magpie would be with harsh black and white. They are nippy little beggars and so you will have to aim for a relatively fast shutter speed, but they are small birds so you can usually get away with an aperture setting that allows for this. Most of my images are at f/5.6 and I aim for a minimum shutter speed of 1/500s. I usually try and take a meter reading off a neutral toned object before I photograph the bird; trial and error suggests that a nicely lit tree trunk is a good guide – a smooth tree trunk, not an oak tree! As I said earlier, they do tend to return to food many times in a short time span (they horde the food rather than eat it straight away) so be prepared for quick, short visits rather than long lingering stops. They will also regularly land a short distance from the food, check for danger and then fly in. If you see a regular pattern emerging you can accurately predict where this will be and wait with your camera pre-focussed on that spot, this often gives a more natural pose. Nuthatches are reasonably hard to spot and find, but once you have you’ll have plenty of opportunity to make the most of it. They’re sedentary and habit forming, use that to your advantage. 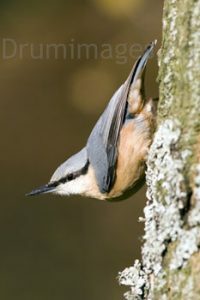 I’ve seen Nuthatches right across the UK and have found that some of the best sites to see them are in relatively busy places; National Trust properties often have large deciduous woodlands with car parks close by. Don’t be ashamed of using your car as a hide!